Learn style and technique from the true rock-stars. 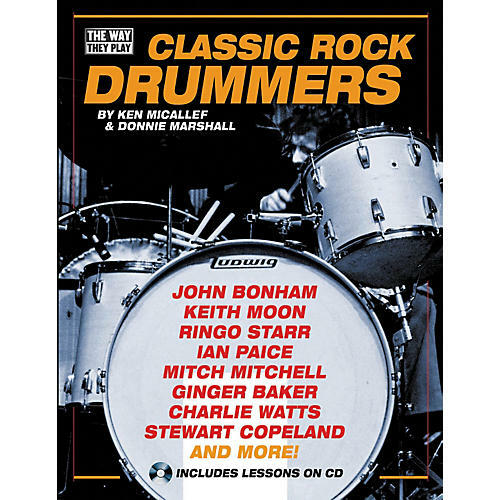 The Hal Leonard book Classic Rock Drummers covers every important aspect of the major drummers of the classic rock era: Keith Moon (The Who), Ian Paice (Deep Purple), Bill Ward (Black Sabbath), John Bonham (Led Zeppelin), Stewart Copeland (The Police) and Mick Fleetwood (Fleetwood Mac), among others. The book explores drumming technique, history, musicality, and instrumental details. Each drummer's standout tracks are here in detail: choice of notes, how the parts strengthened and supported the music, and lasting influences on the drummers of today and music at large. The accompanying CD features sound samples of the styles of the profiled drummers. Includes historically accurate drum equipment setups.